Home > Blog > Ask the Expert : How can resilience training help with redundancy worries? We’re living in a time of uncertainty where many people are, like you, feeling understandably nervous about their job security. What helps here? I’ve outlined below two practices I teach in resilience courses that I hope you find useful. Whatever situation you face, there will always be different ways it can develop. 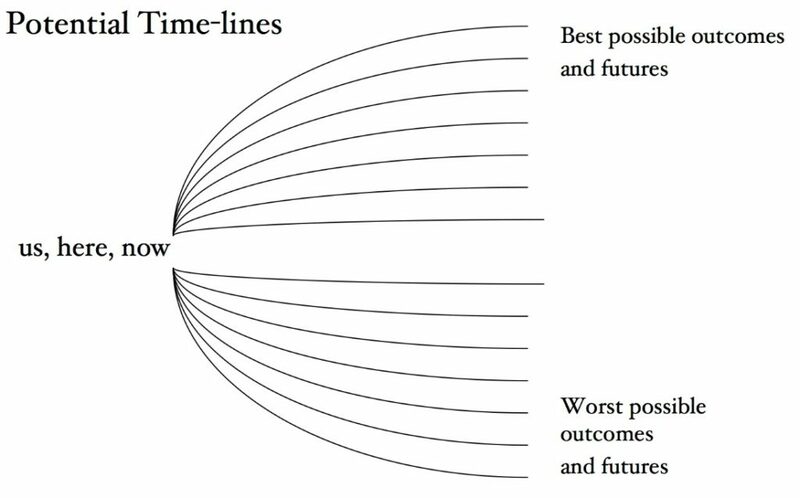 I picture these as a range of timelines, or versions of the future, that can happen from any moment (see diagram 1 below). In the Penn Resilience Program, which research shows helps reduce the risk of anxiety and depression, they teach three questions that help us see this range of possibilities. They ask “What’s the best that can happen here? What’s the worst? And what’s most likely?“. It can be helpful to think about the worst that might happen because this sometimes activates us to take preventative or preparatory measures. Nervousness can be useful when it nudges us to do things that strengthen our position. But if we only think about worst scenarios, particularly if we ruminate about them, we’re more likely to get stuck in low or anxious states. The other two questions help us keep a more open mind, reminding us that situations that seem awful at first can sometimes work out better than expected. Once you’ve considered the range of things that might happen, resilience is about taking steps to make the best more likely and the worst less so. A useful metaphor for resilience training is to think of life as similar to rowing in a boat. 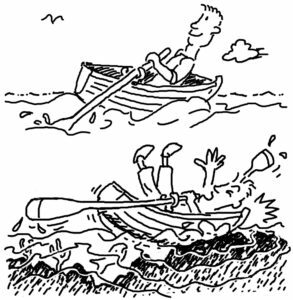 A problem or crisis is a bit like the boat crashing into a rock. In this case, the rock you’re worried about bumping into is losing your job. Thinking about how you might prevent or deal with this is an important part of resilience. However the rock is only part of the story. There is also the water level, which represents your background level of wellbeing and resilience. When you’re at a low ebb, with your water level low, you’re more likely to crash. The issue here is that whatever rocks, or problems, you encounter, you’re more likely to struggle if you’re run down and depleted. If you’re feeling good in yourself, with your coping capacity at a higher level, then you’ll be in a better position to deal with whatever situation you face. When you think there might be a difficult time coming up, asking yourself “how’s my water level doing?” reminds you to look at what nourishes your inner reserves or address factors that drain them. The practice here is to draw a horizontal line to represent the water level of your resilience and map out any factors that push it up or down. Common downward arrows include stress, conflict, heavy drinking and poor sleep. Whichever way things go with your job, these are risk factors that make it more likely that you’ll struggle. Upward arrows represent protective or helping factors that strengthen your ability to cope. These can include simple things like exercise or having breakfast, and learnable strategies, such as mindfulness or problem solving. While some of these things might not seem to make much difference by themselves, when they act together they can shift the balance and put you in a stronger position to deal with whatever eventually happens with your job. These and other strategies are explored in more detail in Chris Johnstone’ s video-based online course Personal Resilience in an Hour.